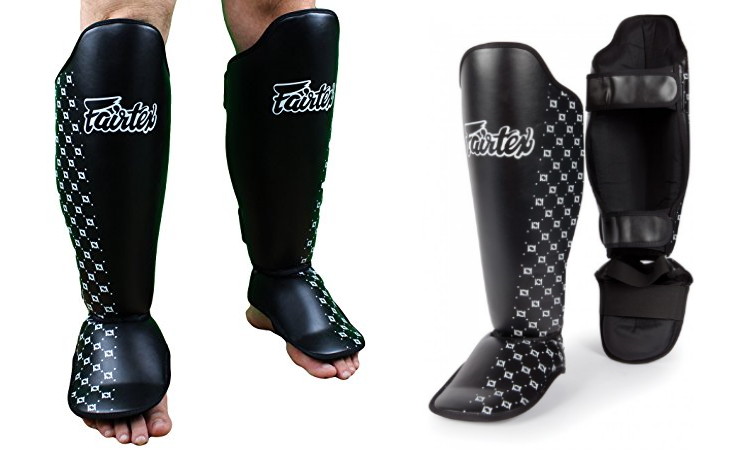 Fairtex is a well-known company from Thailand that makes an assortment of fighting and training gears. Their focus is mainly on products for Muay Thai and MMA. This product review will be examining Fairtex’s SP5 competition Muay Thai shin guards. Furthermore, it will provide my personal experience with these shin guards as well as a summary of customer reviews from various sources. Shin guards are great for cushioning the impact felt on your shin when you throw a kick. In addition to that, your training partner will also be thankful for your utilization of the shin guard since it will disperse the force of the kick and they do not have to feel your shin bone digging into their legs and body. Product Design: Shin guards that use an open back strap system consisting of two hook and loop pull straps. Foot Protector: This shin guard also comes with padding to protect your feet. Stitch Free: No exposed stitches that will cause abrasion with its user’s skin. Distinct Design: Its design allows for an easy distinction between the left and right shin guard. Length of Time: I have owned my pair of shin pads for over 1.5 years. Usage: I have used them to drill and spar in kickboxing, Muay Thai and MMA training sessions. Cost: Off the top of my head, I believe I purchased mine in the $60 range, before shipping, from an online website. It looks like others from different martial arts discussion forums have also noticed the slight increase in the SP5’s original price as well. Open Back Design: The back of your lower leg is completely exposed, except for two adjustable straps. The SP5 open backing makes it easy for me to clean and put on. Size Fitting - I ordered the medium sized SP5 and it fits me well. For the most part, the shin guards do not shift around on me too much during training, as long as I am mindful to actually tighten down the straps and make sure they are secured before I start. I personally do not like to have the shin guard wrapped too tight around my legs, which is probably the main reason why they shift out of place and I have to adjust them in stand up sessions. The other situations where it shifts out of place and I have to stop mid-round to fix it are the grappling scenarios of MMA and when my kicks get caught. Benefits of Adjustable Straps - Being able to adjust the straps has been highly beneficial in the following situations for me. Knee Pads - I have sparred in Muay Thai and MMA training sessions that allow knee strikes. In order to soften the knee strikes thrown and reduce the impact on my knees when shooting for a takedown, I wear wrestling knee pads. I felt comfortable and had no problem wearing the knee pads under these SP5 shin guards. Knee Brace - When I was recovering from a sprained knee, I wore a knee brace that had metal hinges on both sides. The shin guard was able to accommodate it well without being uncomfortable. Shin Padding Thickness: Comparing the padding of this Fairtex shin guard to my training partners’ equipment, I noticed that the SP5 padding thickness lands right in the middle. So far, I have only used the SP5 and do not know if the ones with the thicker cushion is any more effective in reducing the impact felt. How the SP5 Looks: I chose the black color option for my SP5. It has a nice blend of being simple while standing out a bit because of the silk screen design. Plus, I do like how it is easy to tell which shin guard should be on your right and left leg, especially when you are running late to class. Foot Protector: The SP5 foot protector covers the majority of my feet. I have thrown kicks that hit my teammate’s elbow and I was able to feel the pain from it, even through the adrenaline. Therefore, I feel like the foot protector’s padding could be thicker or be made out of a more dense foam material. Elastic Straps for Your Feet - There are two elastic straps that secure your feet to the foot protector portion. The locations of these straps are the back of an individual’s achilles and under the arch of their foot. The strap under the foot does not restrict your heel and the ball of your feet to make full contact with the ground. The following are two scenarios where these straps move out of place for me. I have experienced the strap behind the achilles move out of place during grappling exchanges on the ground. It also occurs when my foot is caught after a kick is thrown and I try to retract it from the teammate’s grasp. The strap under my foot has slide out of place and towards the heel and ball of foot portion, but I simply rub or slide my foot on the mat in the direction needed to move it back in place, so it is not too disruptive. Stitch Free: The shin guard feels great on my shin and foot. I always wear long compression pants when training, so I am not aware of any abrasion that may occur on bare skin. Upper Lip Portion - If you look at the images provided, you will see that the SP5 has its padding extended towards the user’s patellar tendon. It is a nice protection feature that has not caused me any trouble. Stiffness - The stiffness of the SP5 may be great for stand up training, but it is a little awkward if you use it in MMA sparring sessions, especially when the action hits the ground. Overall Thoughts and Feelings: I find the SP5 shin guards to be a high quality product that is easy to use and does a good job of protecting my shins. The only physical sign of its usage are from various creases along the shin guards, but other than that it is holding up well and there are no visible tear in the material. I will continue using them and have no current plans to replace my SP5 in the near future. In order to provide a fair review of these SP5 shin guards, beyond my own perspectives, I have read and summarize the pro’s and con’s from multiple customer review websites and martial arts discussion forums. Conflicting Comments: Below are a couple of topics that conflict between SP5 users. Shifting During Training - Most owners of the SP5 says it fits them well and does not shift during training. While a smaller population feels that it is not as secure as it could be and these shin guards do move out of place on them. These scenarios may be dependent on the owner getting the right size for themselves as well as having to just tighten down the straps more like me. Drilling and Sparring - Many find the SP5 shin guards great for sparring and drilling sessions. Whereas, some individuals comment that it makes great sparring shin guards, but not ideal for long training sessions due to the lack of padding thickness. MMA Practitioners - Individuals training in MMA find the stiffness of the SP5, compared to more flexible shin guards, to not be very comfortable during the grappling exchanges.